The Lotus Evora is equipped with a radiator which has plastic tanks. These tanks will be causing trouble over time as they have the tendency to crack which will leave you with an empty coolant system and no cooling. Not only that is an issue.. you can probably also imagine the effect this will have on the engine.. head gaskets will fail leading to very expensive repair bills..
As you'd expect from us we don't just want to do a replacement of the tanks.. we'd like to go a little further, so we've also increased the capacity. The core is now a 50mm core which helps you getting a more efficient cooling system. If you're planning on doing trackdays or things like spririted driving in the mountains, this upgrade will help you to keep the engine healthy! 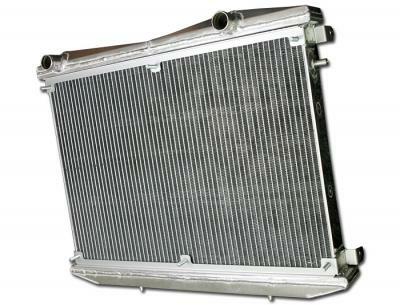 This radiator has the same fitting dimensions as the OE radiator, there's no need to change anything on the car.